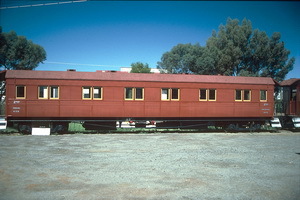 Built at Islington as narrow gauge 2nd class bogie lavatory carriage "221" and issued to the South Australian Railways northern region in July 1920. The October 1920 is was converted to composite dining car and first class saloon car named "Wonoka". One half of the car was fitted with six dining tables for twelve diners, while the other half consisted of twelve movable wicker chairs and three small tables. It was used on the Terowie to Port Augusta service, but was not SA&CR Joint Stock. In 1936 converted to full saloon car. Then in 1938 it was rebuilt to semi-corridor type and reclassified as second class. As part of the 1953 recoding it was renumbered "409". Following withdrawal it was obtained by the Silverton Tramway Museum, Sulphide St, Broken Hill. 7.1920 Entered service as narrow gauge second class bogie lavatory carriage "221", seating 60 passengers. - Used as SA&CR Joint Stock. 10.1920 Converted to composite dining car and first class saloon car named "Wonoka". 1936 Converted to full saloon car, seating 30 passengers. 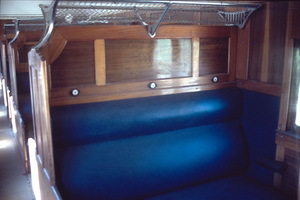 1938 Converted to second class side aisle seating 32 passengers. 1970s Written off and obtained by the Silverton Tramway Museum, Sulphide St, Broken Hill.